Finally, you can experience the likes of Newt Scamander's magical managerie in the palm of your hand! 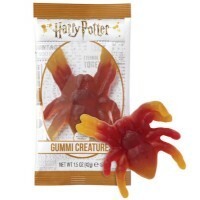 Whether you want to hunt for gold with a niffler or simply cuddle up with a bowtruckle, you can celebrate your love for all magical creatures with a packet containing a Harry Potter Fantastic Beasts Gummy Creature (Aragog, Buckbeak, Fang, Fluffy and Hedwig). Don't worry, these treats aren't like Bertie Bott's Every Flavor Beans- every gummy has a combination of sweet and fruity flavors like cherry, lime, blueberry, and orange. But we all know that an affinity for the unexpected is precisely what makes a perfect magizoologist, so it's impossible to know which creature and flavor combination you got until you open your package! Glucose syrup, sugar, water, beef gelatin, acidity regulator E330, flavors, glazing agent E903, canola oil, coconut oil, fruit and vegetable concentrates (carrot, blackcurrant, spirulina, apple, grape), color E100. Contains GMO. Nutrition facts (for 100g): calories 305Kcal, total fat 0g (saturated fat 0g), total carbohydrate 71g (sugar 65g), protein 5.2g, salt 0g.